Which part of a spring onion should I use? 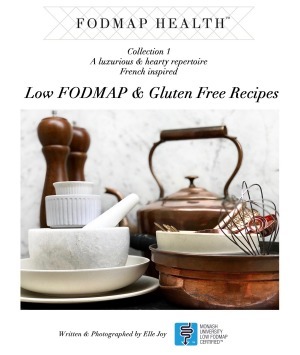 Follow the low-FODMAP diet and need some inspiration in the kitchen? Recipe writer and photographer Elle Joy's new e-book Low FODMAP and Gluten Free Recipes is designed for the one in seven Australian adults who suffers from irritable bowel syndrome. 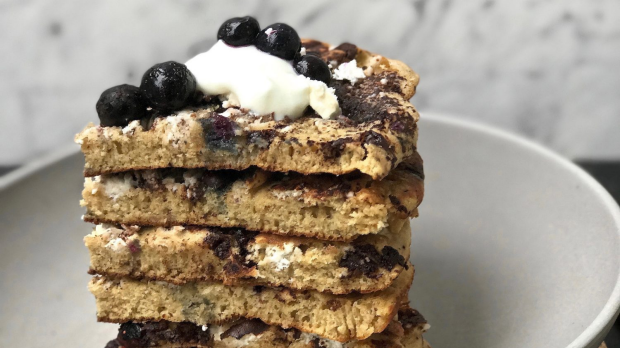 It's filled with 60 recipes certified by the founders of the low-FODMAP diet, Melbourne's Monash University, under its recipe certification program, including breakfast, lunch, dinner and dessert options. Here, Joy shares a week of meal ideas sure to make you feel better, and enjoy your food too. FODMAPs are found in many common foods such as garlic, onion, watermelon and honey. The acronym FODMAP stands for: Fermentable Oligosaccharides, Disaccharides, Monosaccharides, And Polyols. These short-chain carbohydrate sugars are poorly absorbed by the intestine, resulting in gastrointestinal symptoms in some people such as abdominal bloating, pain or distension, diarrhoea and/or constipation. Research in this area is ongoing, so make sure you refer to the Monash University Low-FODMAP Diet app or the Monash FODMAP website for regular updates on which foods are low, moderate and high in FODMAPs. And remember, the low-FODMAP diet should only be followed under the supervision of an accredited practising dietitian after a diagnosis by a doctor. 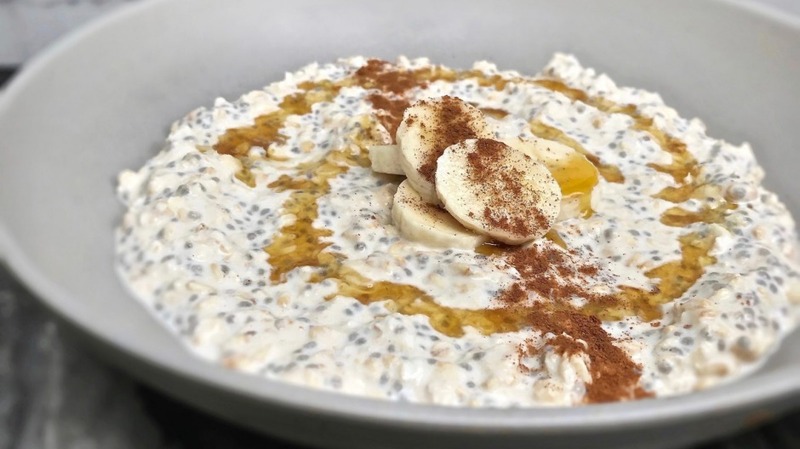 In a large microwavable mixing bowl combine oats, chia seeds and cinnamon with a metal spoon. Add maple syrup, milk and peanut butter (pre-warmed for best results) to the mixture and stir until combined. Cover the bowl with plastic wrap, ensuring there are no air holes and place in the refrigerator overnight. Remove from the refrigerator in the morning and heat in the microwave on high for 1 minute. Give the oats a stir, serve into a medium breakfast bowl and garnish with desired toppings. Over high heat, boil potatoes in 4 cups of water until soft and fluffy. Using a strainer, drain water. Place potatoes back into the saucepan and mash with a potato masher. Add mash to a large mixing bowl. Drain salmon from can, remove large bones and crumb with fingers into the mixing bowl. Add ginger, parsley, quinoa flakes, eggs, spring onion, zucchini, coconut oil and lime juice to the bowl and combine thoroughly with hands or a fork until the mixture is moist and sticks together. Heat a large grill pan over low-medium heat with coconut oil. Using clean hands, roll medium handfuls of mixture into balls and place into the pan until entire mixture has been used. Do not crowd the fish cakes, leaving at least 1cm between each. Using a spatula, press down on the cakes, so they are roughly 1cm in thickness. Allow to fry for 5 minutes. Flip and continue to fry for another 3 minutes or until the cake is cooked through to the centre. Remove cakes from pan and place onto a large plate to cool. 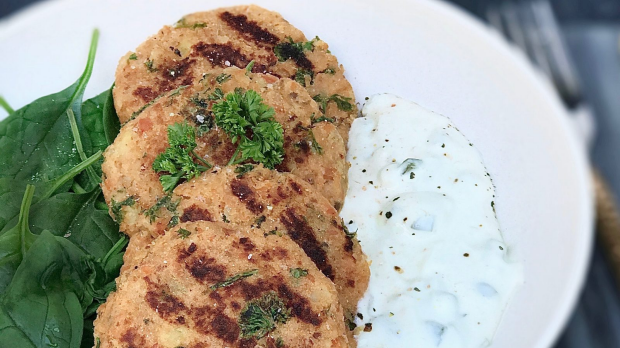 For the dipping sauce, place cucumber, mint, lemon juice and yoghurt into a small dish and combine with a metal spoon. To serve, place ½ cup of spinach on the left-hand side of 4 plates. Align 4 fish cakes next to each serving of spinach. Spoon 1 tablespoon of dipping sauce to the right of the fish cakes and finish by garnishing with sea salt and black pepper. Using a sharp knife, score the rind of the pork by cutting slightly deep slits, 1cm apart. Rub 1 tablespoon of salt into the slits. Allow to dry uncovered in the refrigerator overnight. Preheat a fan-forced oven to 200°C or 220°C for conventional. Line a large roasting dish with aluminium foil and grease rack with rice bran oil. Remove from refrigerator and rub a second tablespoon of salt into the rind. Place pork onto roasting rack and place roasting tray into the oven for half an hour. Reduce heat of fan-forced oven to 180°C (200°C conventional) and roast for a further 30 minutes. Remove from oven and slice into 4 sections with a sharp knife. For the rice, bring water to the boil in a small saucepan over high heat and boil rice until water is absorbed. For the beans, chop any dirty ends off and place beans in a steamer. Over high heat, steam for 10 minutes. 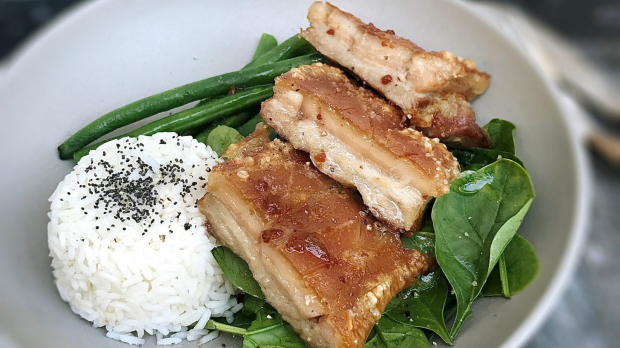 Serve onto large plates and accompany each serving of pork belly with a selection of baby spinach and green beans and rice. Garnish with sea salt and black pepper. 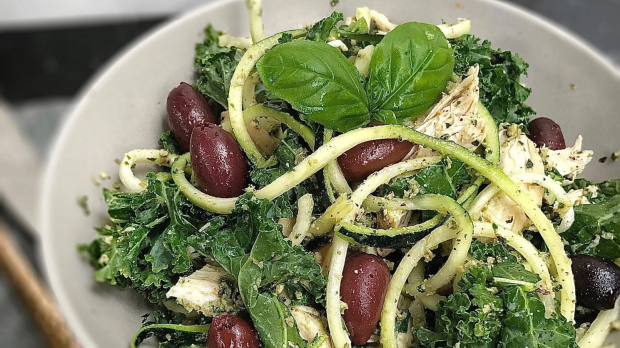 Use a spiraliser or a peeler to create zucchini noodles or shreds. In a food processor, add herbs, nuts, lemon juice, extra virgin olive oil, salt and pepper and process on high for 20 seconds, or until a smooth consistency is formed. Over high heat bring a half full medium saucepan of water to the boil and add chicken fillets and poach until completely white, through to the centre. Remove from heat, allow to cool and shred into long strips with fingers. Using a spiral cutter or potato peeler, create spirals using zucchinis. Over low heat with a dash of olive oil, sauté spirals in a small non-stick frying pan until soft. Remove from heat. In a large mixing bowl, combine all of the ingredients and add chopped olives. Serve evenly into 2 bowls and garnish with sea salt and black pepper. This recipe doesn't need toppings as the chocolate is melted and the feta is very sweet. In a food processor, blend oats on high speed until a flour consistency forms. Sift the dry ingredients into a medium-sized mixing bowl with a sieve and combine with a wooden spoon. Separate eggs. Add egg yolks, lightly whisked, to the dry ingredients and egg whites into a separate medium, dry metal bowl. Beat the egg whites with an electric beater until stiff peaks form and add to the pancake mixture. Add milk and vanilla essence and fold mixture with a wooden spoon until combined. Heat a large frying pan over medium heat with oil. Crumble feta into small pieces with fingers and add to mixture. Add 30 blueberries and lightly mix. Chop chocolate into tiny pieces with a large knife. Pour one third of the mixture into the centre of the frying pan. Sprinkle one handful of chocolate on top of the pancake and wait for the mixture to bubble before flipping with a wide spatula. As the mixture is heavy, expect it to be slightly messy. Continue to fry for 2 minutes or until the pancake is fluffy and cooked through to the centre. Repeat this frying process for the remaining mixture. Garnish with maple syrup, yoghurt and 10 blueberries. You will need 4 drinking or parfait glasses; decorative jam jars can also be used. Start by preparing the passionfruit custard. In a small saucepan, add corn flour to water to form a smooth paste over medium heat. Stir quickly and constantly with a wooden spoon to eliminate any clumps. Add remaining water and stir well. Add passionfruit pulp, butter (or lactose-free margarine) and sugar, constantly stirring until combined. Remove from heat and leave to cool for 10 minutes. Separate eggs, placing egg whites into a clean, dry metal bowl. Blend on high with an electric beater until stiff peaks form. Fold egg whites into custard mixture and place into a bowl. Refrigerate until cold. For the crumble layer, in a large mixing bowl rub together biscuits, coconut, coconut oil, maple syrup and walnuts with fingertips. Form small clumps by pressing the mixture together until thick and crumbly in texture. In 4 serving glasses, spoon 2 tablespoons of crumble into the bottom of each. Place a sprinkle of blueberries on top to create the second layer. 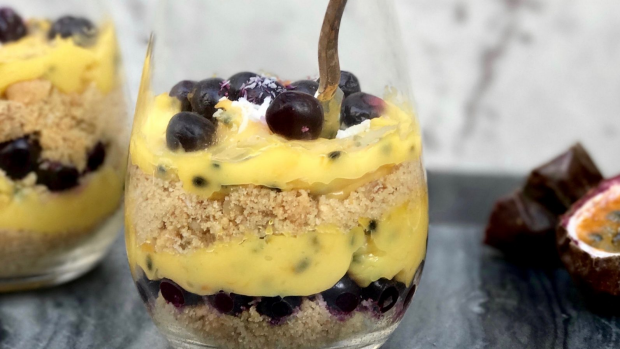 Spoon a generous layer of passionfruit custard to form the third layer and repeat layering process again. Garnish with a light layer of yoghurt and a sprinkle of dried coconut. Place in refrigerator until ready to serve. *Note: In Australia oats are not guaranteed to be gluten free. Oats can only be labelled low in gluten due to manufacturing. Replace rolled oats with quinoa flakes for a gluten-free option. Consult a health professional for more information. This is an edited extract from FODMAP Health's Low FODMAP and Gluten Free Recipes by Elle Joy, available from fodmaphealth.com ($24.95). 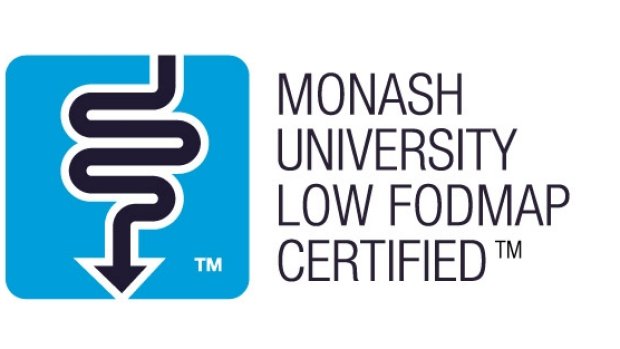 All recipes are Monash University Low FODMAP Certified. One serving made in accordance with the recipe can assist with following the low-FODMAP diet. A strict low-FODMAP diet should only be commenced under the supervision of a health professional.